Warning: Due to electrical potential that exists within and near all transformers, input power must be disconnected before any work is performed. Failure to do so may result in serious injury or death. The information contained herein is intended to be general in nature and therefore may not cover all equipment. For specific data, contact AFP Transformers. All electrical equipment should have scheduled maintenance for long, trouble-free operation. It is suggested that all transformers be cleaned and inspected at a minimum on a yearly basis. Units in dirty or severe locations should be inspected more frequently as conditions determine. De-energize the unit and follow standard lock out procedures. Remove access panels around the unit. Clean any accumulated debris and dust from all surfaces. Blow out all cooling ducts with dry compressed air (or nitrogen if available). Do not use air pressure over 30 pounds per square inch. Pay particular attention to terminal boards, leads, cooling ducts and any enclosure screens. Do not use of solvents due to the possible deterioration of the insulating materials. If there is evidence of moisture, the unit should be dried using heated air. Do not exceed 220ºF (105ºC). Lamps, heater or blowers may be employed. The drying process should be done slowly, taking 48 to 72 hours, depending on the size of the unit. Extreme caution must be followed to ensure that the unit is completely clean and dry before being energized if moisture has been detected. If the has needed a drying process, the unit should be meggered after drying and before being energized to check that the insulation system is acceptable. Please consult the factory for the proper megger readings if necessary. Loose connections represent one of the single biggest modes of transformer failures in the field. Loose connections overheat and cause insulation damage that leads to premature failure. All connections should be checked for required tightness for bolt size. Contact AFP Transformers if this information is not available and is required. AFP transformers utilize both copper and aluminum terminations. If any connection is found loose, the connection should be renewed with the application of a good quality joint compound. Some of the available compounds are Thomas & Betts 1059, Penetrox A and Alnox-UG. These compounds are conductive and all excess material should be removed. Any cable replaced should be terminated with proper UL listed screw or crimp type connectors. 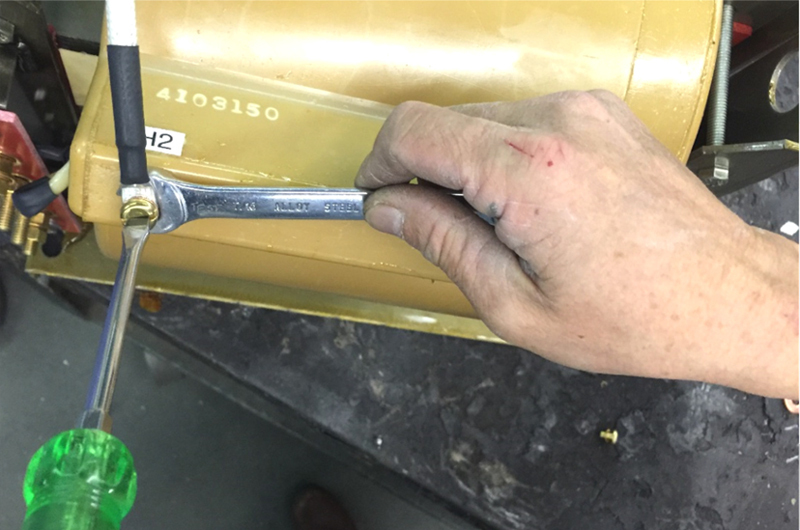 Using the appropriate size wrench listed below, refer to the picture and secure the threaded hex stud in place prior to applying and torque to remove or install the slotted head machine screw. Once the hex stud is secured in place you may now proceed with your installation or maintenance checks. Less than 37.5kVA – 7/16"
50 to 250kVA - 5/8"
9 to 112.5kVA – 7/16"
150 to 500kVA - 5/8"
Care should be taken in tightening hardware to prevent any damage to the casting(s) or secondary terminal board. Secondary connections must be made under the nuts provided. NO additional hardware should be added.